Late to leave for lunch, there was a difference of opinion about how far to go on two wheels. Andy suggested we take it easy and travel about a half-mile down the road. I countered that we stretch ourselves and do a 10 mile round trip. He wasn't having it. I won. He on the Brompton and me on the Voodoo, it's off past the Holeshot Cafe and on into Brightwell (A1093), then right for Bucklesham. Wind's in our hair as we cut a left and emerge, warily, onto the busy A12/A14 intersection. This is serious car land, the terrain of JG Ballard, not Louison Bobet. Somehow made it over to the A1156, past Levington turn-off to the Doubledeck Diner, and one final left. 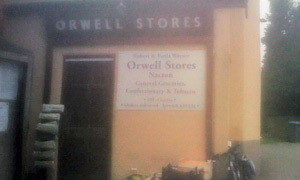 Now in Nacton and lo, 'tis the Orwell Stores. No nice bench here and lots of noisy vehicles going past. There's time to admire the small ads for gardening services and read the minutes of the last parish meeting while Andy takes a call. As he does, the chill sets in and makes for a brisk ride back, bypassing that 'orrible roundabout in favour of a route past the decrepit Hollies sports club. Use it or lose it, as they say. If it was a car -- Singer Gazelle V.
If they were passing by -- George Baker.